Solu-Plus is a unique, organically complexed fermentation extract designed to extend nutrient availability. This “Nutrient Mining Technology™” takes approximately four weeks to complete. Plant and soil health promoters include: bio-surfactants, microbial food sources, vitamins, enzymes, and trace elements. Solu-Plus contains an organic compound package totaling 37%! 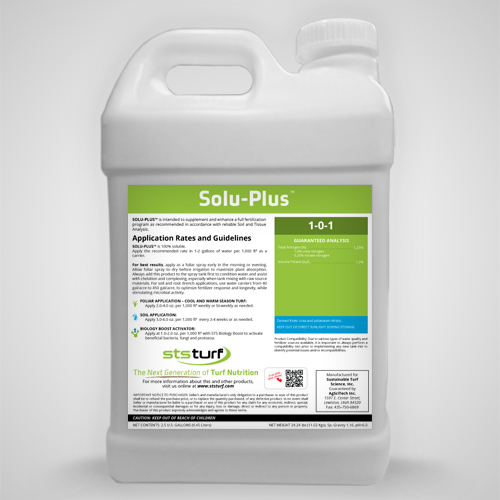 Solu-Plus enhances the utility of any product you apply, including raw source materials, pesticides, fungicides, and herbicides. Nutrient Mining Technology™, with highly functional groups of carboxylates and the ability to donate a charge, releases otherwise unavailable nutrients, then the chelating and complexing action of Solu-Plus, stops the electro-magnetic attraction between positive and negative charged elements, which optimizes fertilizer absorption. This technology utilizes “Daltons” to represent constituent size. Foliar applied nutrients must be smaller than 600-700 Daltons to efficiently get through the plant cell structure. Solu-Plus is engineered to measure below 500 Daltons! Due to its rich concentration of organic compounds, Solu-Plus will assist in buffering poor quality water.